Selina Beltran is tired of the stereotype that indigenous students go to school for free. 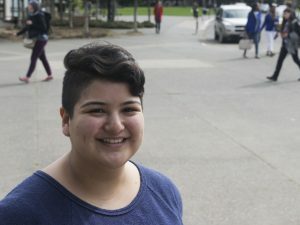 The second-year student at the University of Victoria once confronted a girl in class who was telling other students that indigenous people get “free spots” at university and all their tuition paid for. Salia Joseph describes the funding she receives from Squamish Nation as a scholarship. Not only that, these misconceptions mask the fact that an increasing number of indigenous students are competing even harder for federal support money because more of them are now graduating from high school and going on to post-secondary while the dollars available haven’t increased for 20 years. There are 5,600 fewer Canadian indigenous students a year now who get band support compared to 1996, when 27,000 students got some money. 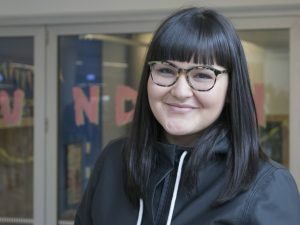 Salia Joseph, a fifth-year indigenous studies student at the University of British Columbia, said the small funding she receives from Squamish Nation is a scholarship. 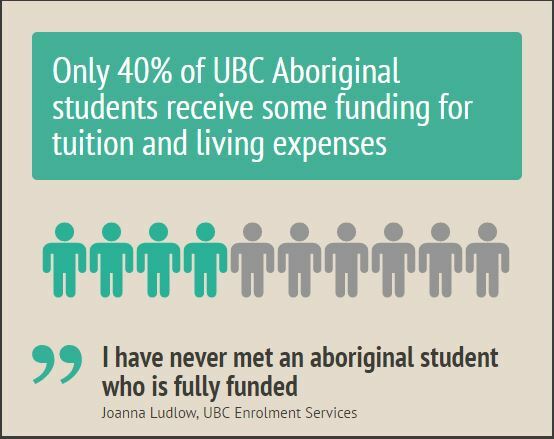 Joanna Ludlow, with enrolment services at UBC, said that of the university’s 1,388 self-identified aboriginal students, those getting band funding has never exceeded 40 per cent. “I have never met an aboriginal student who is fully funded,” Ludlow said. Joseph is one of those students who gets some funding. But she works two jobs and has taken out loans to finance her degree and living expenses in Vancouver. Each of British Columbia’s 198 First Nation bands devises its own way of distributing post-secondary funding. But the resources they have to work with are limited. In 1996, the federal government capped funding increases to all First Nation programs at two per cent per year. Post-secondary funding, in particular, felt the squeeze because the cap failed to keep up with inflation and ballooning tuition costs. Prime Minister Justin Trudeau said he would be lifting the cap on First Nations programs, but the promise did not materialize for the post-secondary student support program in the March 22 budget. Coty Zachariah, chairman for the national aboriginal caucus of the Canadian Federation of Students, campaigned for months to lift the federal program’s cap leading up to the budget reveal. “I even met with Indigenous and Northern Affairs Canada Minister Carolyn Bennett back in February and we were told … specifically, that the PSSSP cap was going to be lifted,” Zachariah said. Zachariah, who is Mohawk, has felt the impact of the funding cap. Federal program money comes from the Department of Indigenous and Northern Affairs Canada and is distributed to First Nation band offices using a formula based on population. Eligibility is limited to status First Nation and Inuit students. It does not apply to Métis or non-status students. Thane Bonar, director of communications and policy at the First Nations education steering committee, says that rising tuition costs, a growing aboriginal population and more indigenous students graduating from high school who want to pursue post-secondary are stretching bands’ funding. “[A band’s] allocation doesn’t provide them with enough resources to support all of their students. So often you might have a very long waiting list, [and] communities are forced to prioritize,” Bonar said. He explained that prioritizing may mean students fresh from high school get preference over mature students. Or the community may choose students going into nursing if the community needs more nurses. But Bonar said even if a band gives a student “full” funding, that amount rarely covers the entire cost of getting a university degree. On paper, Beltran receives “full” support from their band but it doesn’t cover all their expenses. Tsleil-Waututh covers Beltran’s tuition and gives them a $975 per month living allowance. But the average rent in Victoria for a one-bedroom apartment in 2014 was $849, which means Beltran has to find ways to stretch their funding dollars. “It gets tough sometimes,” Beltran said. Living with roommates keeps Beltran’s rent under control, and visiting the food bank weekly helps with grocery costs. Volunteering at events Beltran is passionate about can mean free meals, and teaching seminars brings in honoraria cheques. Selina Beltran says they’ve encountered a lot of ignorance regarding what benefits First Nations people receive from the government. Zachariah, from the student federation, remains invested in the campaign to lift the federal funding cap and believes that post-secondary offers a brighter future for First Nations youth. Beltran says, for them, being at university as an indigenous person shows extreme resistance to the colonial state.